There was a special feeling in the Faribault High School boys hockey locker room just after warm ups Saturday at the Faribault Ice Arena. The Falcons got a visit from the 1993 FHS hockey team — the lone section championship squad in school history — and the alums chatted with this year’s crew about what it means to be part of a successful team. 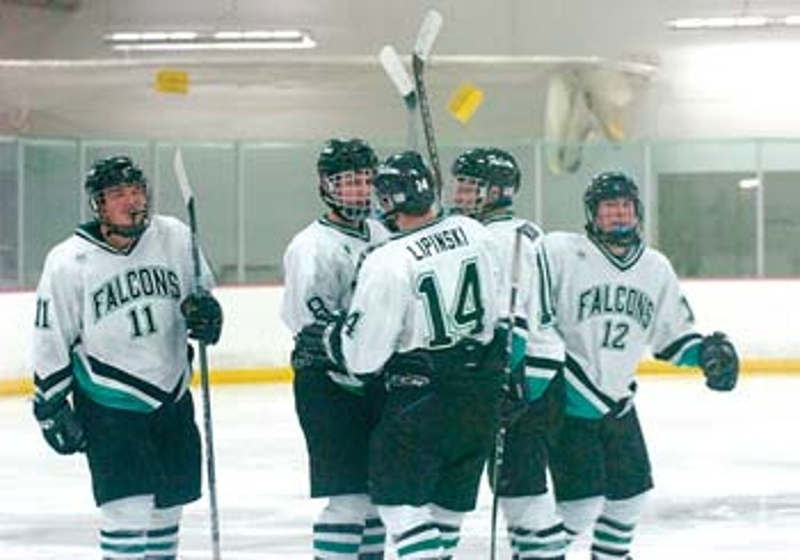 Then, almost on cue, the 12th-ranked Falcons unleashed a furious offensive outburst on visiting Minnehaha Academy (6-7), ultimately beating the Redhawks 12-1. Junior Sean Lipinski notched three goals and three assists, and Jimmy Kittlesen, Trevor Bisping and Marcus Wierschem each scored their first varsity goals in the rout, which began with a 6-1 first period onslaught and included the Falcons (11-4-0, 3-0 Big 9 Conference) outshooting Minnehaha Academy 37-10. Goalie Aaron Forgaard notched the win as he steered away nine of the 10 shots he faced. — Sports Editor Mark Remme may be reached at (507) 333-3129. Scoring — First period: 0:56 FHS Nick Murray (unassisted), 1:10 FHS Garrett Gulsvig (Brandon Parker, Ryan Dwyer), 10:10 MA Matt Wolpert (Peter Knutson), 11:37 FHS Dan Mahoney (George Richie), 13:24 FHS Marcus Wierschem (unassisted), 13:53 FHS Jimmy Kittlesen (Colbey Hullett, Parker), 14:00 FHS Bo Putrah (Mahoney, Richie). Second period: 1:50 FHS Trevor Bisping (Sean Lipinski, Murray), 4:10 FHS Lipinski (Dwyer, Bisping), 7:04 FHS Lipinski (Gulsvig, Aaron Forgaard), 11:58 FHS Gulsvig (Lipinski, Dwyer), 17:18 FHS Lipinski (Gulsvig, Isaac Dahl). Third period: 8:00 FHS Dwyer (Lipinski, Hullett). Shots on goal — FHS 37 MA 10. Power plays — FHS 0-2 MA 0-3. Saves — FHS Forgaard 9.